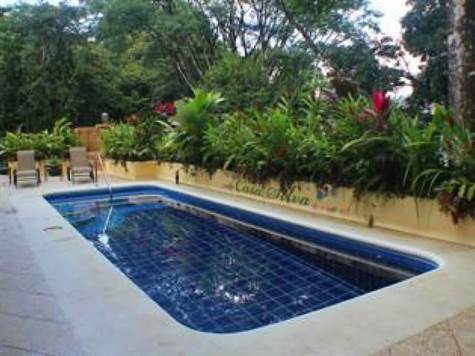 Casa Selva is located in Manuel Antonio near Quepos, Costa Rica. About a 2.5 hour drive from San Jose or 20 minute flight to the local airport in Quepos. Tucked away in a rainforest setting this new home is in a gated community of 6 homes. The main floor has a great room with kitchen, dining and living areas terrace with pool and pantry with a half bath and access to the back patio. There is a bedroom at each end, one queen and other with twins, with private baths. On the lower level, there is a studio apt with queen bed, kitchenette, bath and private patio. Amenities include TV’s with cable, Internet, telephone, pool, concierge and available staff. This villa is turnkey .